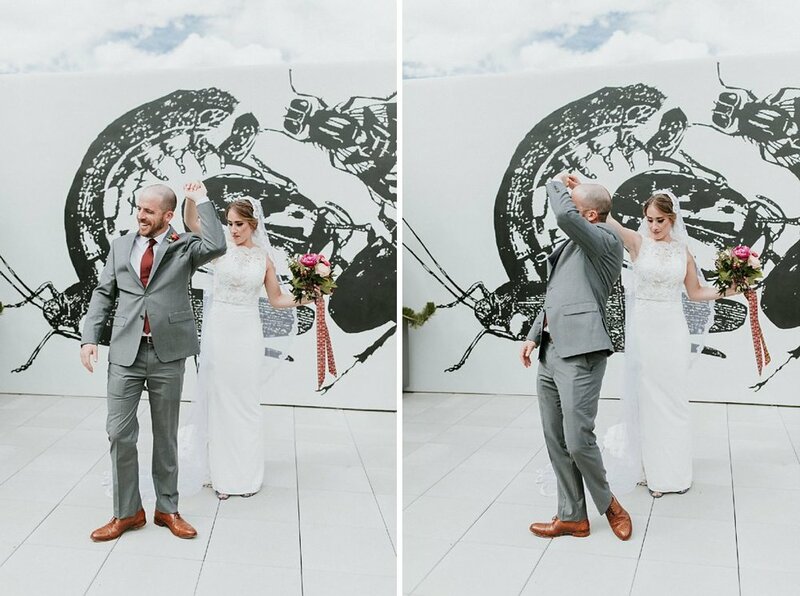 Even though its a newer wedding trend, we definitely have a soft spot for bride and groom first looks! 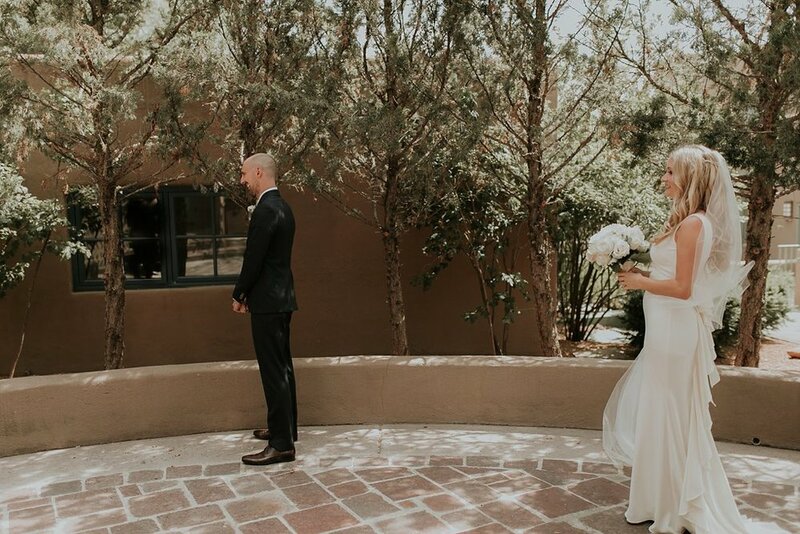 Not only are first looks incredibly exciting, it also provides the soon to be newly weds with a few moments to soak in how amazing their futures spouses look before walking down the aisle. 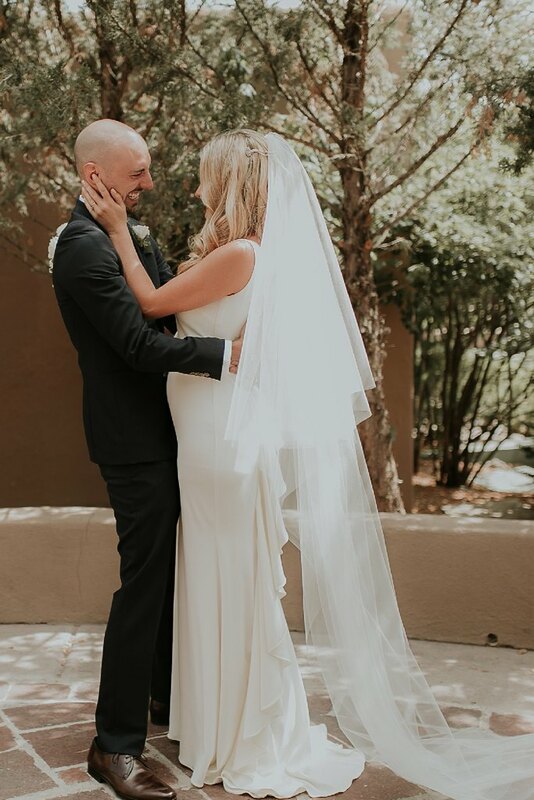 We talked to one of our recent brides, Taylor, to get the scoop on why she and her new husband Kirk decided to do a first look and her advice for future couples! 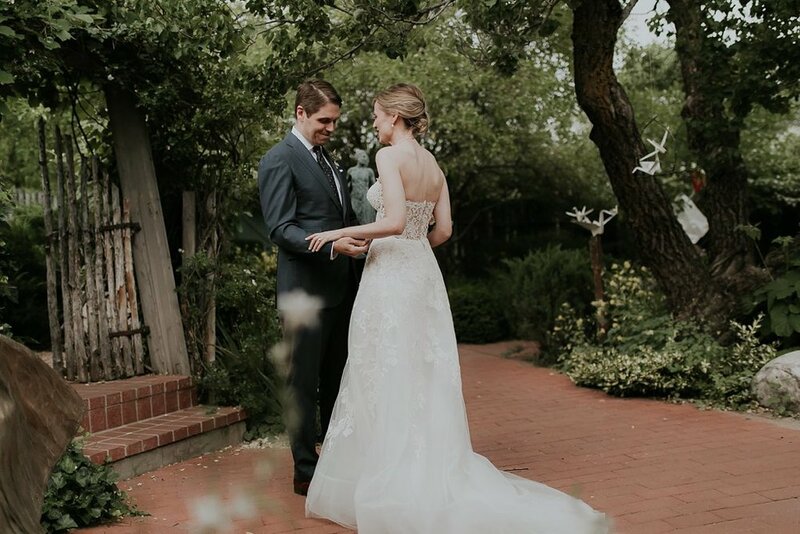 "Kirk and I had discussed this 2 or 3 times leading up to the wedding and it just made the most sense for us, for a few reasons. 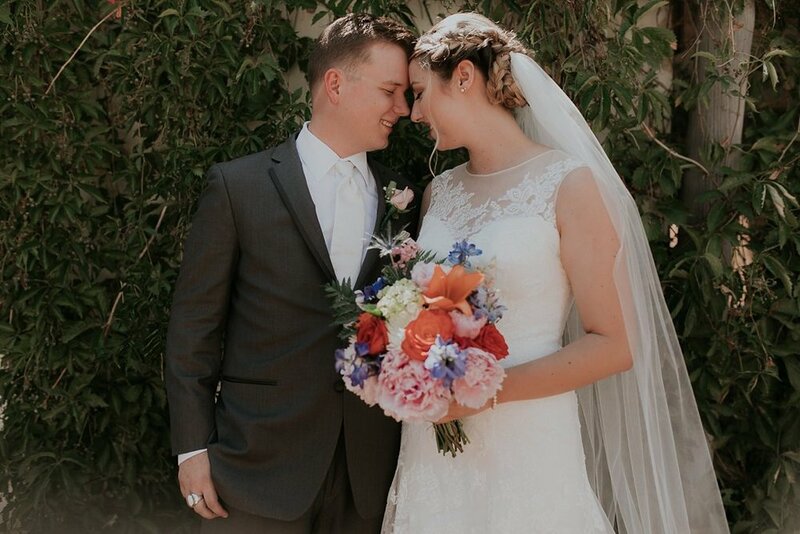 1) Kirk thought he would be too overwhelmed and wouldn't have been able to pay as much attention to the ceremony if he was seeing me for the first time while I was walking down the aisle with my Dad. 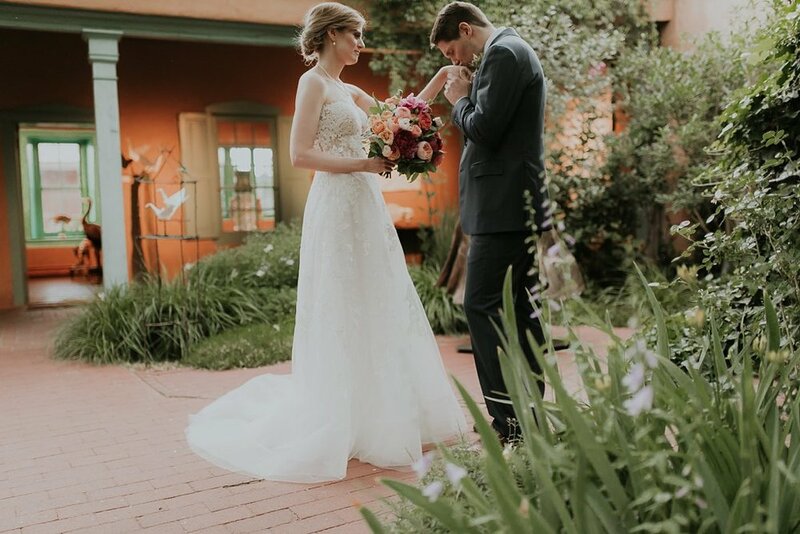 2) We had 100 people that we weren't able to be included in our ceremony due to the size of the Loretto Chapel, they were hanging out and waiting for us up at a cocktail hour at La Fonda (our reception venue), so doing the first look and being able to take photos prior to the ceremony was important to us. 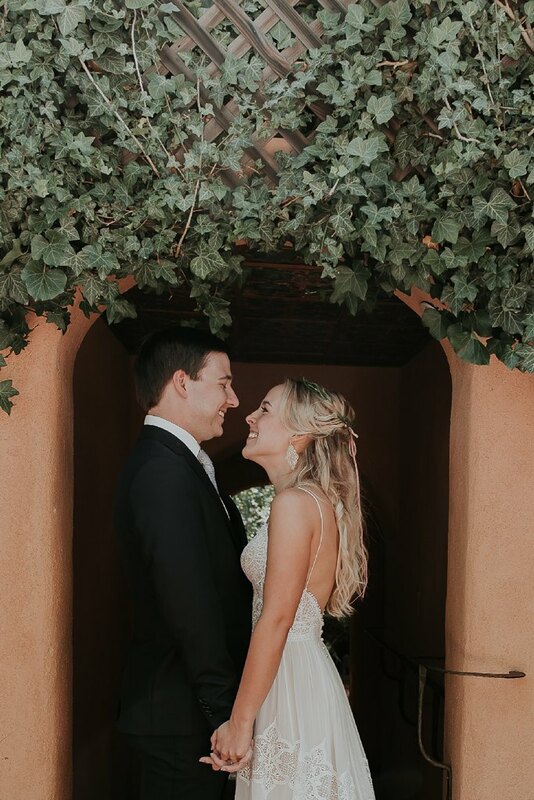 We wanted to be able to spend as much time with our guests as possible, because every single one of them was traveling to be with us - it was the least we could do to be as present as possible!" 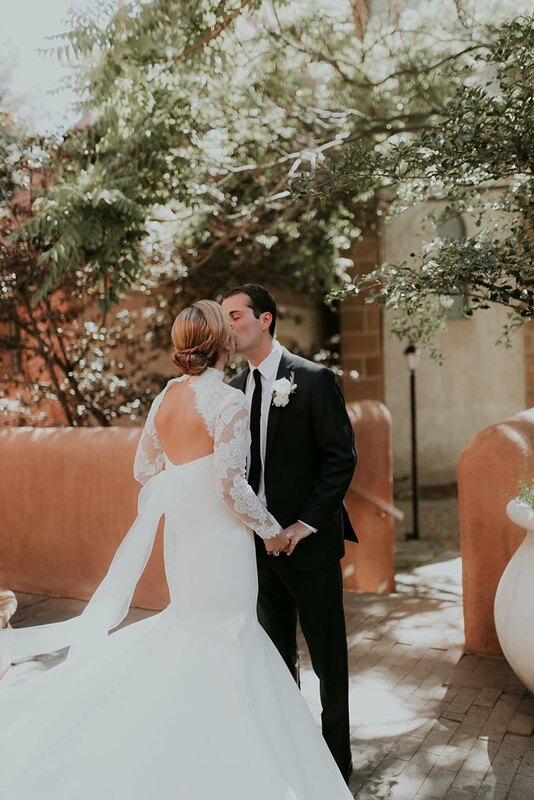 "I had such butterflies when I was walking out of the Bridal Suite at La Fonda to the staircase where I knew Kirk would be. 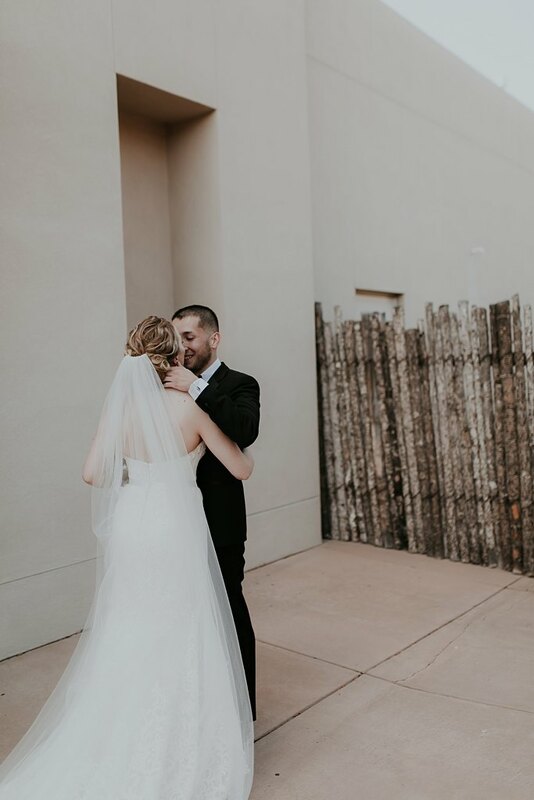 By far the most amazing part of the day was seeing his face the first time he laid eyes on me in my full wedding day get-up. 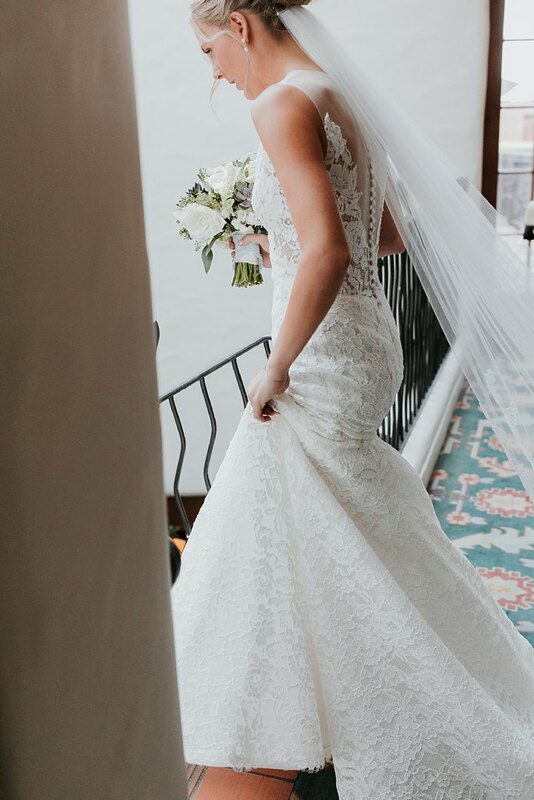 We share everything together so having to keep my dress and veil a secret for so long was a serious challenge, but 100% worth the wait. 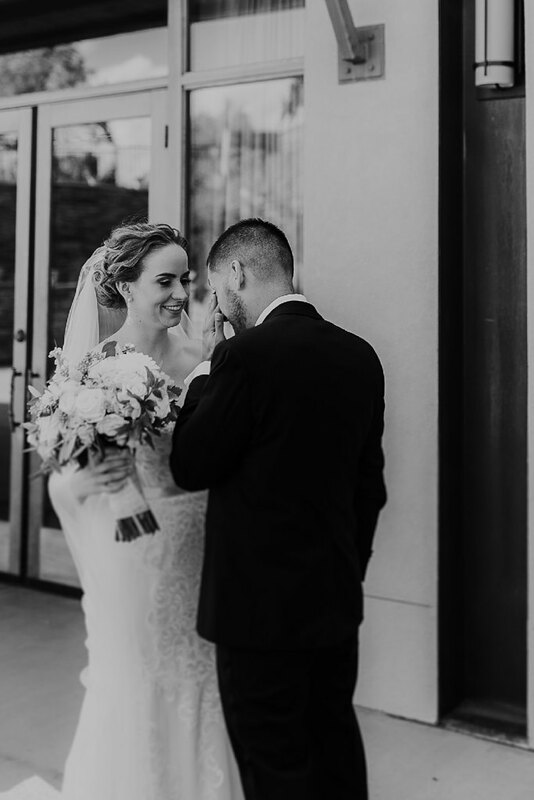 The look of love and absolute certainty in his eyes calmed me down and we were able to have a few quiet moments just the two of us before meeting up with our rowdy bridal party." 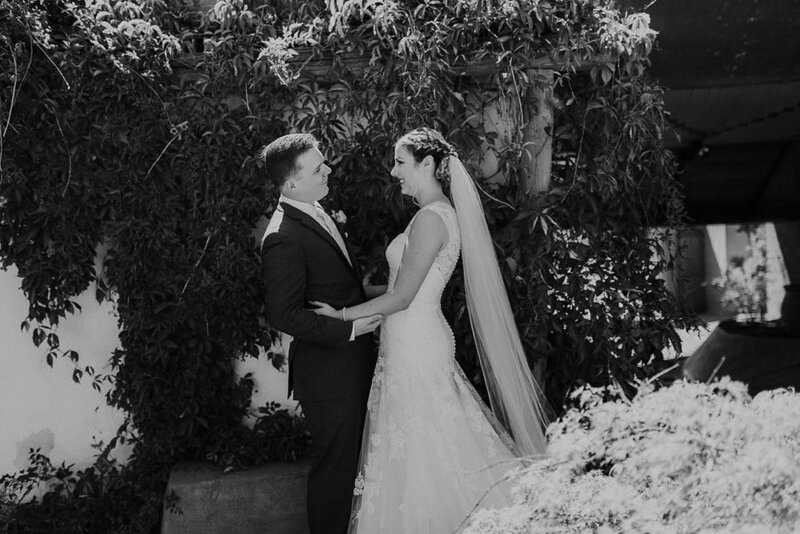 "I highly recommend doing a first look - we're usually sticklers for tradition but this is one I'm very glad we broke. 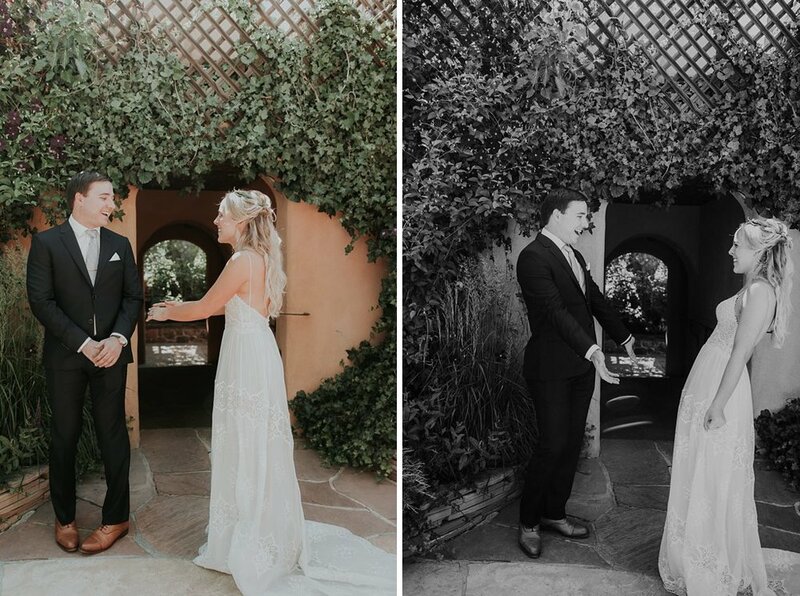 Being able to see your fiance for a few minutes (just the two of you) before becoming husband and wife was so special and something I will treasure forever, plus it really does cut down on the amount of time you spend away from your guests for pictures after the ceremony - which they were very appreciative of!"